Yesterday, cigar maker Litto Gomez showcased his new “Air Bender” blend at two Old Virginia Tobacco locations. We caught up with him at the in-store event in Falls Church, Virginia, to try the latest release from La Flor Dominicana and get his thoughts on the ever-encroaching war on tobacco. Air Bender, formerly a blend exclusive to La Flor Dominicana events, sports an Ecuadorian Habano wrapper and Dominican binder and filler tobaccos from Litto’s farm in La Canela. He’s been stockpiling the wrapper for a few years now to make sure that he can keep the blend consistent going forward. Not as spicy as his well-regarded Double Ligero blend, the intended profile is of “refined power,” says Gomez. Air Bender is offered in four vitolas that retail for $7-8.25 apiece: Matatan (5 x 50), Guerrero (6.25 x 54), Maestro (5.25 x 52), and Valiente (6.25 x 60). Each name honors a kung fu warrior. “I’m enamored with Chinese culture,” said Gomez. Some think the line’s name is itself a nod to martial arts (apparently there’s an animated television series called Avatar: The Last Airbender). We asked what fans could expect next from La Flor Dominicana. Gomez says a smaller ring gauge version of the Air Bender should be ready in time for the IPCPR Trade Show in August. (All the initial sizes in the line are 50 RG or larger.) He was also excited about Small Batch No. 3, due out in a few weeks. The anti-tobacco lobby has always pushed for more bans and taxes, he explained, and until politicians feel someone pushing back there’s nothing to stop them. 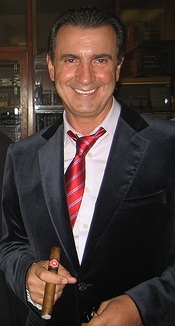 That’s why Gomez has been a key supporter of Cigar Rights of America (CRA) since its inception in August 2008. Whatever…the cigar is great and I look forward to seeing a smaller ring version of it that will allow that wrapper's flavor to come through even better. It's a total Martial Arts reference. If not, why are the sizes named after "kung fu warriors.". The band even has some crossed swords on it (frankly I'm surprised Ghurka isn't upset about that). Perhaps he's trying to backtrack because he found out about the cartoon and the movie based on it this summer? And if you haven't checked out Avatar The Last Airbender, you're missing out on a real treat. Even if you don't like cartoons. Some of the best writing on TV in years. I'm not sure why his explanation means it isn't also a kung fu reference. Maybe he came up with the airbender concept then connected that to his love of martial arts movies with the names. I've actually done some research on this whole thing (too much time on my hands, I know) and it's all very bizarre. The original claim was that it was a tribute to his love of Kung Fu movies. Some people claimed that the "Air Bender" was some mythical Kung Fu master, but I've also read that the first reference to Air Bender came in like 2005 with the "Avatar The Last Airbender" cartoon, which came from Japan…not really known for its Kung Fu movies. So that kind of blows up the idea that the name is based on old Bruce Lee-era movies. Then there are those crazy swords…which don't resemble anything I've ever seen in a Kung Fu film (admittedly, I haven't watched any in many years), but are more like something out of "Arabian nights." Then there are folks who are confusing "Avatar The Last Airbender" with James Cameron's "Avatar" which is just kind of comical. In the end…it really doesn't matter what he calls it, it's a helluva cigar, but this whole naming thing and the explanation has at least provided some fun kabuki theater for the last couple months (like how I slipped in that Japanese genre reference in there just for fun?). Ive smoked a couple of these airbenders. I really like them. I would give my comments regarding the flavor profile, but I just cannot remember off the top of my head. dmjones: just a nerd clarification. Avatar The Last Airbender is an American production, not Japanese. It's drawn in an Anime style but it's from the US. I have had two airbenders, both were o.k., and the second, a toro vitola, was almost completely plugged. I paid over $8, and I'm done with LFD stuff for a while. Not much flavor in this one to me, and I'm tired of faulty construction ruining the experience for my money. I smoked a habano perfecto after the bender and preferred the habano, for those who have not tried it!